Rumors about Microsoft entering the waggle market with a specialized, Wii Remote concept swiping controller have been popping up for the better part of a year. Talk of a partnership with Gyration, speculation that Bungie had quashed a proposal for a motion controller tied to Halo 3 and murmurs that Rare was now tasked with leading the waggle wand brigade have been bubbling up frequently. Microsoft and Gyration have both denied or brushed off the rumors, but we've just heard it pop up again. According to sources that will go unnamed, Microsoft may be showing its Xbox 360 motion controller as early as next week to press, a controller geared specifically for Banjo Kazooie 3 gameplay. 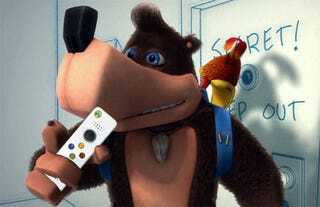 In fact, we've heard that select members of the press have already seen the controller—in use on the next Banjo Kazooie title—in action. Microsoft plans to show off some of its 2008 and 2009 wares at an event next week, one that hits during the Game Critics Awards at which some of the "Best of E3" awards are judged. Occasionally, NDAs and embargoes ensure that what is shown at the Game Critics Awards doesn't go public until E3 proper, which may keep details on a the rumored new Xbox 360 controller under wraps. However, Microsoft's event next Tuesday, at which the new Banjo Kazooie is confirmed to be shown to North American press, comes with an embargo that lifts before the event kicks off proper. That means that whatever is on display for press will be revealed next Tuesday morning to everyone. Keep in mind that an Xbox 360 controller with motion control capabilities is still a rumor for now. We've heard some conflicting information about the controller's visibility to the media and that Microsoft may hold onto any new hardware reveals until E3. We'll know for sure Tuesday morning what's in store.